Orchids are the flowers that has most species recorded in the world (30,000), is known to have existed 60 million years ago, being privileged the forests of South America and Malaysia with the more diversity; adapted to the most diverse habitats, they can be found throughout the world (only Antarctica and driest deserts of the earth they lack of them), the smaller measure they measure just a few millimeters (stenostachya Platystele), which in some cases they can only be appreciated under a magnifying glass. 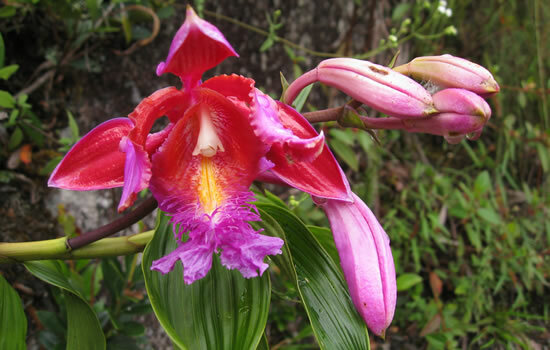 But you can also find the huge (Sobralia dichotoma) with dozens of bouquets of flowers, with a height of up to 4 m, that can find in the historic sanctuary of Machu Picchu. Machu Picchu, houses a flora, of the most exuberant of South America, within this, highlights the ornamental flowers such as orchids, exotic and extravagant colors, with 80 genera and 400 species scientifically recorded, eight of these are new to the botanical researchers, also seven new species of orchids in three new varieties, give the Historical and Natural Sanctuary of Machu Picchu, thirty-eight new records, the publication Nº 15 of Icones Orchidacearum (global specialized scientific journal) presented in mid-August this year in the city of Cusco, three new orchids more, found in the Sanctuary. Epidendrum Ochoae, dedicated to a biologist Gustavo Ochoa Estrada (director of the program of Conservation and Biocultural Management of Machu Picchu). Epidendrum Incahuamanii dedicated to Feliciano Incahuamán Atausinchi (conservative vigilant of Machu Picchu). Epidendrum Mormontoyi, dedicated to Rolando Mormontoy López (vigilant and conservator of the road network of the Sanctuary Machu Picchu). Orchids are usually pollinated by bees, birds, wasps, moths, beetles, flies, etc. 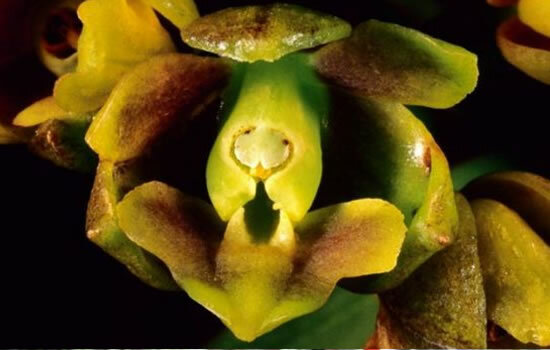 When the orchid is opened, it emits aromatic scents, inviting and seducing to some pollinators to land on the flower. In Machu Picchu a fascinating pollination occurs, being refuge of exotic birds, and more than 300 species of butterflies, that make the pollination an incredible colorful spectacle in one of the most shocking planet’s ecosystems, conformed by mountains covered abundant vegetation which in turn is home to numerous species of birds and mammals in danger of extinction, such as the spectacled bear and sachacabra or pudú, the world’s smallest deer. It takes three to seven months to mature, after this time it opens; depending on the species, each fruit can release up to four million seeds to be released and carried by air currents or transported by pollinators, if they fail to germinate a log or branch, giving way to the symbiosis with the fungus germination, appearing the first leaves. After 5 or 6 years, the orchid reach their adult stage, stage from which sprout beautiful flowers for several years. People say that a popular legend, the story of a forbidden love; a beautiful princess of the Andes in love with an Inca warrior, hidding her love because she was destined for the Sun God. It is said that when his father found out, forbade the princess to see the warrior. 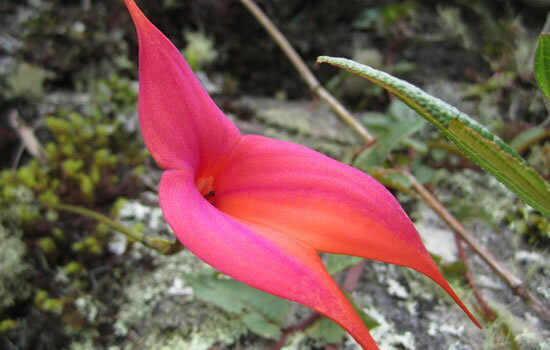 She when hears this decision, began to run through the Andes, crying for her forbidden love, time would take care to make she in the Waqanki beautiful orchid (Masdevallia veitchiana Rchb. F.) Carries the spirit of the beautiful princess, so every time when he found her, he would remember his beloved, and he could weep with sorrow. This would be the only testimony that the orchids existed in the Inca empire, it is both the attachment to this legend that even in these days you can hear songs about love and beautiful warrior Waqanki. So beautiful that gave origin to the legend Inca Waqanki. With beautiful iridescent petals; the great variability in color and shape of their flowers makes no camera achieves capture in all its splendor, being much appreciated by farmers around the world, what has earned many international awards. Find a beauty like this in their natural environment, it is part of the experience offered by the Sanctuary of Machu Picchu. 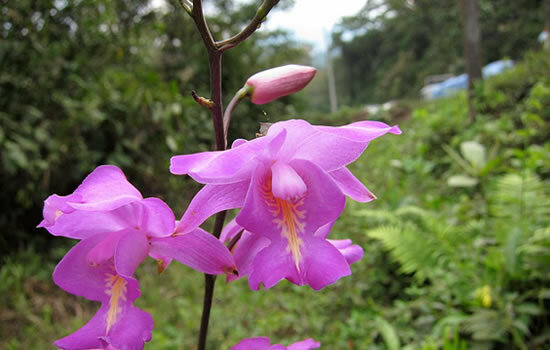 It develops between 2,100 and 3,310 meters of altitude, land and rarely epiphytic habit. It is widely used for creating hybrid species. Measuring up to 20 cm long and 6 cm wide. This tiny species measuring just 8 mm, of its strange shape provides its name, which derives from the greek meaning pointed tongue, it extends from Mexico to Brazil and Bolivia, is developed in rain forests and cloud forests with temperatures from warm to cold, from sea level to 2,600 meters. It is an epiphyte plant, medium, uniflora, as the tulip and magnolia, with flowers 2.8 x 2.8 cm. It can perceived for its similar to cilantro aroma. Its flowering lasts 15 days. Discovered by the missing outfielder Moises Quispe (pulled by a landslide years ago) and it can be found from the sea level. Epiphytic orchid that spans countries such as Ecuador, Colombia, Peru (Cusco and Cajamarca) and Bolivia, we can it find between 1.700 and 2.100 meters of altitude. So simply beautiful that inspires peace. It is found in the moist subtropical rainforest and moist jungle subtropical of the sanctuary. It can be found in clusters of up to ten, with a fragrance among jasmine and roses. 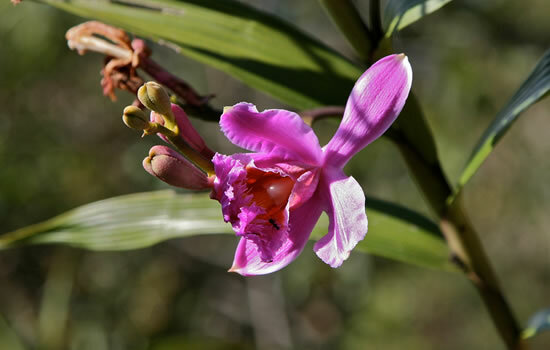 In this small it is found growing as an epiphyte and litófita in Venezuela, Colombia, Ecuador, Peru (Amazonas, Cajamarca, Pasco, Cusco, Puno) and Bolivia. In the historic sanctuary of Machu Picchu is found from 2,060 up to 4,150 meters of altitude, it is developed in mountainous rainforests, growing as a vine. Endemic to the Historic Sanctuary of Machu Picchu, blooms between August and October is found from 1,500 to 3.600 meters of altitude, especially in cloud forests with cold climates, has clusters of long-stemmed flowers few of 5 cm. long by 4 cm. wide. Epiphyte warm and cold zones, extending from 500 to 2,400 meters it is found in Peru and Bolivia, easy to find in the Historic Sanctuary of Machu Picchu plant. 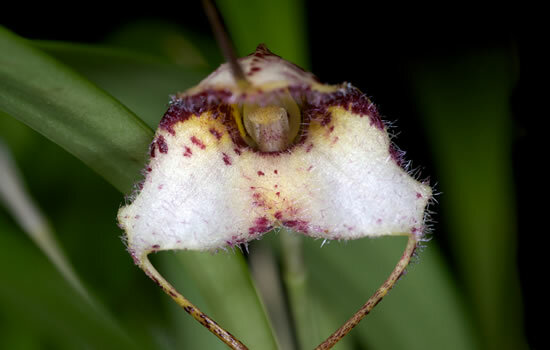 It develops in the humid subtropical forest and humid sub-tropical rainforest premontane, presents a unique flower about 10 cm. long, sprouting from the base of the plant simultaneously. Land. Resizable with two to four lanceolate leaves. Formosa plant (presented spheroidal bulge), the flower varies from 4-5 cm. long, have stems with about a dozen of purple pink to fuchsia. Most flowering is from January to February. Epiphyte. Pseudobulbos: It has stunning flowers bright yellow with red-brown spots have a size of 2-5 cm. long. Labellum prominent, discoid, unifoliate. Its flowering season is from February to May. Terrestrial and Epiphyte, leathery leaves. Petals brown-purple, large, reaching some 20 to 80 cm. long. They have reported two blooms per year, May, June and February. This is the flower of orchid more big that exists. Terrestrial, it presents beautiful flowers speckled red-brown with elongated pseudobulbs two to three leaves; It has a size of 2 to 3 cm. long. Most flowering is from November to April. Epiphytic and terrestrial, leaves rather smooth leathery. With flowers 1.5 cm long, and creamy green to yellow in sepals and petals. Flowers from October to December. Earth, is found in abundance in the sanctuary of Machu Picchu, the size of their flowers varies from 2-3 cm. long, it has an iridescent color ranging from white to fuchsia. Its flowering is almost throughout the year. His native name is "Wiñaywayna" which in Quechua means "Forever Young". It gave its name to the current archaeological complex of Wiñaywayna. Its leaves were used by the Incas as a symbol of nobility. Basically terrestrial, plant with stems up to 5 m. high, generates bouquets of 5-8 flowers, fuchsia petals; fuchsia and bright orange labellum. Its flowers last only 1-4 days, with a single momentary existence. Also known as the "Flower of Paradise." It has a size of 6-8 cm. wide. Most flowering is from February to April. Terrestrial and Epiphyte. It has cavities, which give the feeling of grooves. Usually 2 to 3 sheets; flowers of 6 to 9 cm. wide, dark brown sepals, petals and labellum creamy white its flowers are long lasting. It blooms from November to January. Terrestrial, presents pseudobulbs dark green, ovoid, two to three leaves. With a flower that measures 7 cm. long, white with pink points purple in the labellum, sepals and petals. Flowers from October to November. Epiphyte of lanceolate leaves. With flowers of 3 cm, transparent, sepals and petals with reddish brown lines. It flowers from September to October. New species for the science, discovered in Machu Picchu Pueblo Hotel. Clearly epiphyte of short stems and oval leaves. It has a flower 4 cm long. Yellow green sepals and yellow petals with purple veins. Column with purple brown mushrooms. It blooms from April to June. Epiphytic or litófita. Sepals light purple to pale pink with purple spots, leathery leaves large, up to 12 cm. long, white petals, with a flower is about 7 cm. long. New specie to science. It blooms from December to January. Epiphyte. Inflorescence flattened, in clusters, linear leaves acuminate. It is presenting a flower up to 2 cm long. Sepals and yellow petals. Labellum yellow with purple veins. Its flowering stage runs from January to February. Epiphyte with cylindrical pseudobulbs, unifoliate leathery. With flowers up to 2 cm, with sepals, petals and labellum purple pink to fuchsia (with a notorious spurs). It blooms from December to March. Epiphyte. Sheets prominent uniflora petiole. Flowers with 6 to 7 cm. long; sepals whitish spots and veins with red-purple color. This species is new to science. It has beautiful white petals.